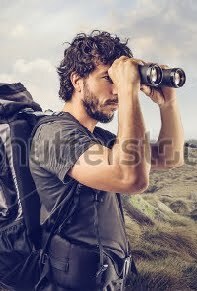 Binoculars are made lighter since they have to be hand held. It provides the advantage of viewing with both eyes to give the three dimensional effect or the feel of depth. However, the three dimensional effect is hardly perceived by the eye when viewing objects situated beyond three kilometers. Moon, the nearest object visible from Earth is located farther than three hundred and fifty thousand kilometers at any point of time! I still feel that I see things better when I use two eyes instead of one and this is where binoculars score over telescopes. Binoculars usually have very low magnification compared to telescopes and it could be difficult to spot the red spot of Jupiter with that magnification. However, binoculars are very useful in viewing deep sky objects like distant galaxies or the milky way band from very dark locations. Binoculars offer a wide field view and gather more light helping us spot diffuse objects. This is why binoculars are preferred over telescopes for viewing large and diffuse deep sky targets. Know your requirement before you buy a binocular or a telescope. Please check out the various models on display below. You can also browse for more models after clicking the Amazon link below. Optical telescope is just one of the many types of telescopes available. There are other types of telescopes like X-ray, infra red or ultraviolet telescopes that find application in advances scientific research. For an amateur astronomer who treats sky watching just as an enjoyable hobby, an optical telescope is the right choice. There are two types of optical telescopes available that are reflecting and refracting telescopes. The refracting telescopes employ a pair of lenses and the reflecting telescopes employ a pair of mirrors. Refracting telescopes have smaller magnification and would be suitable for viewing solar system planets and their moons.The reflecting telescopes are better at larger magnifications as it is more cost-effective compared to refracting telescopes as the magnification goes up. The most critical specification of a telescope is its focal length. Higher the focal length, better the viewing experience is. The focal length is usually expressed in inches, an one inch telescope being most basic and a four inch telescope being a good entry level option for an amateur astronomer. Some telescopes have focal length that run into meters and these are used in advanced scientific studies. It is believed that Galileo Galilei used an one refracting telescope when he became the first man to spot the moons of Jupiter. Please check the various options given above and there is more to check by clicking any of the links above. Can our telescopic observations match some of the great astronomy pictures we would have seen in magazines? It certainly cannot match the quality of some great pictures no matter how great the binocular or telescope is. Why is that so? Some of the great pictures we see in magazines or net would be usually long exposure shots of galaxies or nebula. A human eye can only see the instant image but not process the long exposure images by itself. What are the reasonable targets for a 4" telescope or a 50 X 7 binocular? Jupiter and its 4 Galilean Moons. The famous rings of Saturn. Andromeda galaxy (will appear like a fuzzy cloud. Do not expect to see the spiral arms). 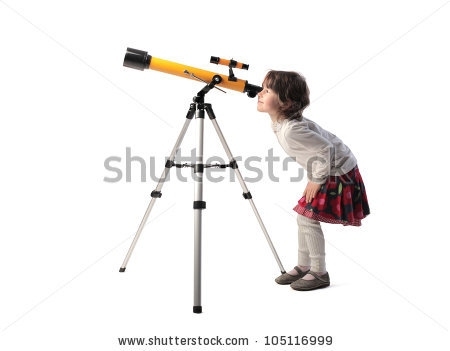 What to expect from a binocular or a telescope?